118 pages | 1 B/W Illus. The ability to be divided along ethnic and religious lines is inherent to much of Africa’s media. Such potentially divisive reporting has the ability to incite violence through prejudiced information, particularly during election processes. Reporting African Elections examines the impact of media messages on society, focusing on these electoral processes in Africa. 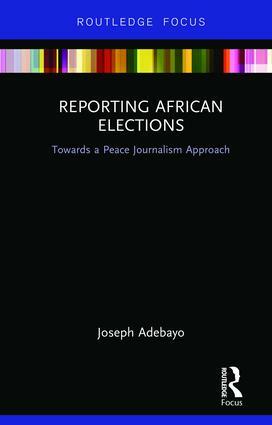 Drawing upon the Peace Journalism approach to political reporting, this book offers a unifying conceptual framework for analysing the role journalists play in ensuring peaceful elections. Joseph Adebayo also looks at the impact training can have on election reportage, studying recent elections in Kenya and Nigeria in order to present a 17-point plan for reporting elections in Africa. Reporting African Elections will be of interest to scholars and students of journalism, peace and conflict studies, and politics. 3. Instigators or Mediators: Exploring the Role of the Media in Electoral Violence. Joseph Adebayo is a postdoctoral researcher at the University of Cape Town. He holds a PhD in Public Administration (specialising in peace-building) from the Durban University of Technology.